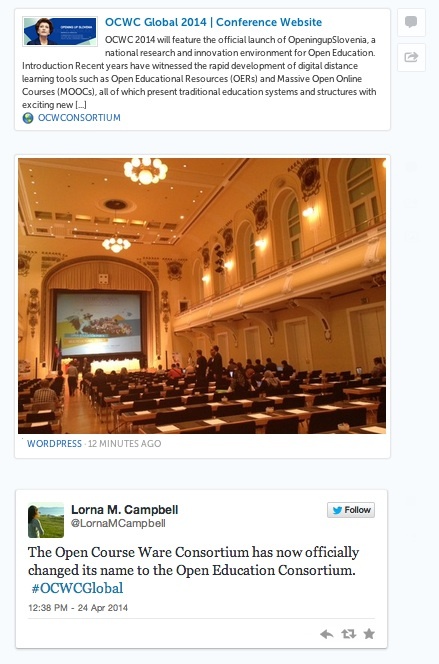 I’ve made a storify of a few of my twitter highlights from the recent OCWC Global Conference in Lubljana here: OCWC Global Conference Storify. Without a doubt my twitter highlight of the entire event has to be from Peter Bryant…. This entry was posted in higher education, lrmi, MOOCs, oer, openscot, policy and tagged cetis, creative commons, higher education, lrmi, moocs, ocwcglobal, oer, open, openscot, policy, ukoer. Bookmark the permalink.